This morning's frost was a warning, it's now or never. Time to preserve the last of the fresh herbs from the garden. Making compound butter and pesto seems to have become a Thanksgiving tradition around here. 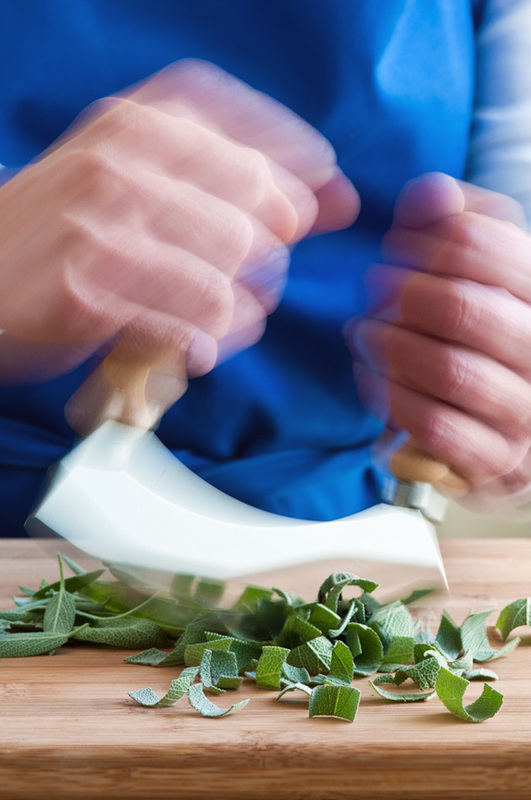 After all, what's a little extra chopping with all the cooking going on this weekend? It's all part of my frantic last-ditch efforts at saving a little bit of summer's goodness for the winter months ahead. A few batches of Ligurian Pesto, and a couple of pounds of herb butter later, my freezer is stocked and my kitchen smells amazing. When the snow flies, I will be very grateful for a pat of chive butter melting over my vegetables. It's often the littlest things that make me ridiculously happy. Today, I made three different combinations; sage with Parmagiano Reggiano, chive with pink Himalayan salt, and french tarragon with lemon zest. The tarragon and lemon is reminiscent of a Bearnaise sauce. it's really good melting on top of a grilled steak, or on steamed white fish, or green beans and almonds. It's pretty versatile. The sage and parm I like to keep on hand for those occasions where I make fresh pasta. Ricotta & spinach filled ravioli with sage butter is my idea of the perfect meal on cold winter night. The sage and Parmagiano combination is also delicious melting over a veal saltimbocca, the perfect finishing touch. Chive butter gets used up first in my house, it is a big favorite on eggs, potatoes, or any steamed veg for that matter. I added the pink salt, because I'm currently deeply infatuated with fancy finishing salts. I can't help it, it's the food stylist in me. The colours are irresistible - pink, gray, black salt, and the amber tones of smoked salts, they are like sparkly little gems. The basil plants are reserved for making traditional Ligurian pesto. For my recipe and instructions, click here. 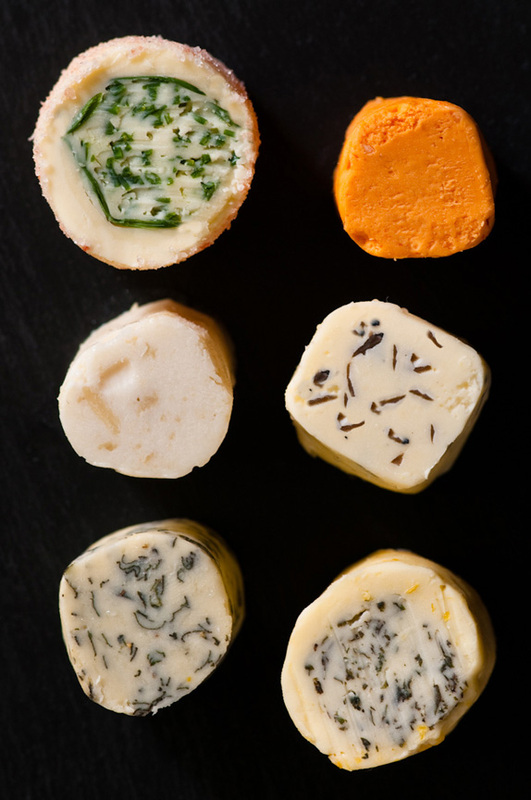 Compound butters not only provide a great opportunity to preserve a little bit of summer for the winter months, you can also preserve other seasonal delicacies this way. I'm speaking of the king of compound butters, truffle butter. Fresh truffles don't last long and are not easy to find, so if you lay your hands on some and can restrain yourself to save a little for later, truffle butter is an amazing treat. Locally, fresh truffles are occasionally available at Ratinaud, check with them around Christmas. Sriacha butter and beure gascony can be made any time of year, they are both so delicious and versatile, I decided to include them too. The duck fat is also available at Ratinaud. I love finishing a risotto with truffle butter, it smells as if a fresh truffle is being shaved on to your plate as it melts, pure joy. The beure Gascony tastes so decadent smeared on warm crusty bread, this is how I most often enjoy it, but it is amazing melted over almost any veggie as well. I use the Sriacha butter on everything from steamed veggies to grilled meat to popcorn, adds some nice heat and saltiness. Sage & Parmagiano - mix 1/4 pound of softened, unsalted butter with 2 tablespoons of chopped fresh sage leaves and 1 tablespoon finely grated parmagiano. Roll into a log and chill. 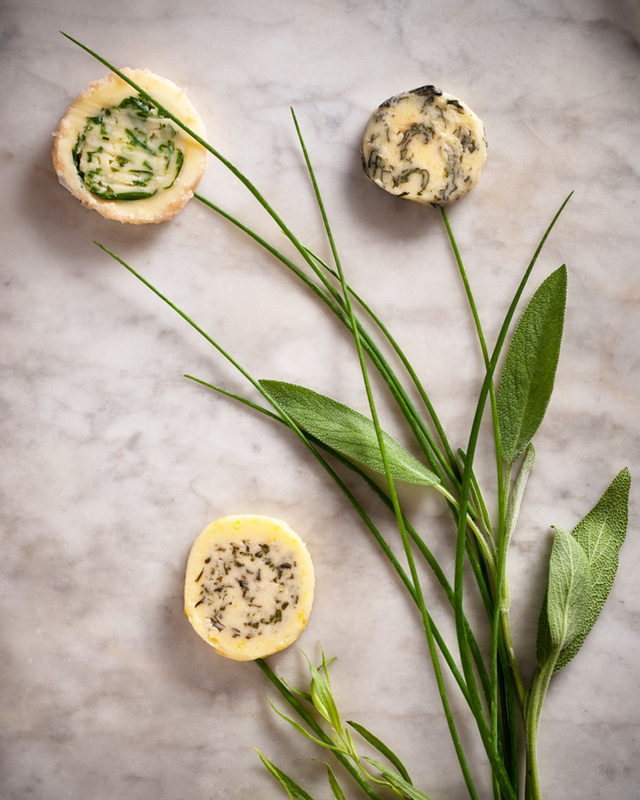 Salted Chive - mix 1/4 pound of softened, unsalted butter with 3 tablespoons of finely chopped fresh chives, roll into a log and then roll the chive butter in coarsely ground pink Himalayan salt. Chill. Beurre Gascony - start with 3 cloves of garlic, not peeled. Put the garlic in a small saucepan and cover with ½ inch cold water, bring to a boil. As soon as the water boils, drain and repeat the process twice. Peel the poached garlic and smash the cloves into a paste with the blade of your knife. Combine with 1/4 cup of duck fat. Bearnaise - mix 1/4 pound of softened, unsalted butter with 3 tablespoons of chopped fresh tarragon and the zest of 1 lemon. Roll into a log and chill. Truffle - mix 1/4 pound of softened, unsalted butter with 5 grams of finely grated fresh truffle. Sriracha - mix 1/4 pound of softened, unsalted butter with 1 tablespoon Sriracha and 2 finely minced anchovies. I've found that by keeping a ziplock bag full of various compound butters in the freezer, I'm able to whip up some pretty fancy meals without a lot of planning.